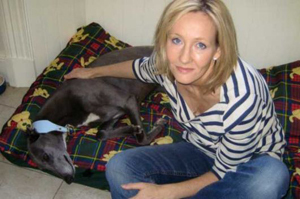 The author of th e Harry Potter series Joanne Rowling (born July 31, 1965, pen name J.K. Rowling) adopted a dog.? ?Although her family already has a dog - Jack Russel Terrier, named Butch, Miss Rowling decided to take another. Helping not only the dog, but also the rescuing? ?center, she payed for a dog much more than it was required. Celia Fernie - the owner of the Scottish Rescuing Center - was very surprised when Joan Rowling, instead of fifty pounds, which were discussed, left her a check for a thousand pounds.? ?Even the hostess herself had no idea with whom she dealt, until she looked at the name written on the check.? ?She said she had invited Mrs. Rowling and her family to come to the Center just to make sure that her dog will go for a good home and a good hands.? ?The famous writer and her family seemed very nice people and Celia agreed to give them a dog for adoption.? ?The money, Celia got from Joan Rowling, were spent on the medical treatment? ?of some certain inhabitants of the Rescuing Center. Incidentally, in the Scottish Rescuing Center are living mainly the Greyhounds, that are no longer able to participate in dog races.? ?The fate of a "retired" Greyhounds is usually not very pleasant. Most of them are going to be euthanized or given away to the shelters, where they are often kept in small cages, which do not have enough space even to move freely.? ?Of course, one can never blame the owners of this rescuing centers, who are usually good and sincere people.? ?Such, for example, as Celia and her husband Jimmy Fernie.? ?They love what they do and care for their greyhounds allot.? ?The main problem of all rescuing organisations is indeed a lack of financial resources.? ?Therefore, very often the shelters are offering ordinary people to take the dogs to their homes, where they can get enough warmth, care and love.? ?According to Celia Fernie, the dogs from the shelters are the best and most amazing dogs in the world. Returning to Miss Rowling, we note that, despite the fact that she is considered as one of the richest women in England, and was able to acquire for herself the dog of any breed - the finest and the most??expensive? ?in the world, she have chosen the greyhound from the Scottish Rescuing Center.? ?In such deeds you can always see a??generosity? ?of a person.